Johnson finished the 2011 playoff season healthy, but spent part of his offseason rehabbing after arthroscopic surgery on his left knee. Though he was never under serious consideration to start training camp on the PUP list, he’s already been shelved with what’s being called a minor groin strain early in camp. Already reason for concern for Andre Johnson in 2012? There are two ways to look at this latest injury. First, it’s entirely possible that Johnson’s strain isn’t meaningful and – given his recent history with muscle strains, his importance to the team and the relative lack of importance of early camp workouts – the Texans are choosing to be hyper-cautious with him. Second, it could be a sign that Johnson’s conditioning after rehabbing his knee wasn’t what it should have been and that this latest muscle strain may be the first sign of a long season in the training room. I’d lean toward the first scenario, but wouldn’t stand on the table arguing with someone who was adamant about the second. Fantasy Assessment: The WR position is deep enough this year that drafting Johnson before the mid-second round is a poor risk-reward proposition. He’ll have to stay healthy and hit his ceiling projection to make that investment worthwhile. If his ADP falls after this latest injury and doesn’t rise if/when he proves himself in form later this preseason, the risk-reward profile will be much more attractive. Manning was never a consideration to be placed on the PUP list after a promising OTA season. Thus far, reports from camp have been mostly reassuring. Manning has made it through multiple practices in a row without showing fatigue and his accuracy and velocity on short and intermediate routes has been impressive. However, reports by Peter King and others note that Manning has yet to really let loose and that he’s not throwing many deep balls during early camp practices. Manning himself still acknowledges that he’s not fully back to his pre-2010 form. None of this is unexpected. It may look like conflicting information, but Manning’s recovery is going to be micro-analyzed in the media well into the season. Each pass, each grimace, each stretch and every outcome will be scrutinized. I think the take home message today is this: There is no guarantee that Manning will fully regain his former arm strength, but the process of nerve regeneration could continue for another 12-15 months. I think the positives – accuracy in practice, lack of arm fatigue after multiple practices – are great signs for a successful year for Manning. I’m less worried about the lack of deep throws in practice. There’s a big difference between will he make those throws and can he make those throws. We likely won’t know the answer to the latter question until he’s in the pocket in live game action. Fantasy Assessment: Right now, I’m leaning toward betting that Manning makes a successful return this year. The Broncos’ offense has the pieces to protect Manning and give him the targets he needs to reclaim a spot as an above-average fantasy QB1. Charles has two things in his favor that Adrian Peterson does not. His injury occurred three months before Peterson’s and was an isolated ACL injury. It’s a good sign that his rehab progressed without setbacks and starting the preseason on the PUP list was never a strong consideration. Don’t be concerned if the Chiefs limit his camp repetitions in these first couple of weeks. Avoiding conditioning injuries and limiting pain and swelling during this time are paramount to Charles hitting the ground running by opening weekend. Fantasy Assessment: Charles has elite fantasy RB talent, but a full return to pre-injury form isn’t assured despite the promising start and the specter of Peyton Hillis stealing significant touches looms. I’m keeping Charles in my RB1 with Risk tier for now. Rank and draft him higher if you’re willing to deal with the inevitable week-to-week variance we’ll see this year. There were concerns this spring that Williams wouldn’t be ready for the regular season. A few practices into camp, Williams is reportedly showing some of the burst and cutting ability that he was known for before his knee injury. The next hurdles for Williams will be making it through consecutive practices without pain and swelling and carrying over his good start into live game action with the pads on. With the status of Beanie Wells in limbo, the stage is set for Williams to earn a big role in the Cardinals’ running game over the next month. Fantasy Assessment: Williams seems to be on his way to overcoming a very serious injury. But, despite the opportunity he’ll have with Wells struggling to get back to practice, don’t overpay/overdraft Williams until we see the strong start carry over into game action. I’m not yet willing to move him above the Flex with RB2 Upside tier. Leshoure avoided the PUP list but couldn’t make it through the weekend healthy, suffering a hamstring injury early in camp. Like Andre Johnson, this muscle strain could be nothing or it could be a sign of poor conditioning or that Leshoure was compensating – consciously or subconsciously – for his Achilles injury. The refrain is the same here. There are plenty of practice and game reps to come, but Leshoure needs to make it through a string of practices and live game action without further setbacks before he can be considered ready to handle more than a minor committee role. Fantasy Assessment: Off-field concerns and a possible conditioning issue early in camp are a concerning combination. I still like Leshoure better than Best, but we’re not likely to get fantasy clarity in the Detroit backfield anytime soon. Ingram’s clearance for full contact and ability to take the field for consecutive practices early in camp was a pleasant surprise this weekend. Ingram’s late spring knee surgery came with a 6+ week rehab expectation and on the heels of concerns that he had a chronic knee condition before entering the league. Like Wells, that combination of circumstances raised the specter of a more invasive procedure than was reported. Unlike Wells, Ingram is back on the field and reportedly looking in good form. Fantasy Assessment: Ingram’s durability history and the unknowns surrounding the Saints’ game plan for him from week-to-week will keep the hype surrounding Ingram low. But Ingram is a talented back who will be a steal as your RB4. I’ve always been high on Ingram and a healthy preseason will push him back into my RB3 with Upside tier. Gronkowski was held out of OTAs in May, prompting concerns that his recovery from offseason surgery wasn’t progressing as expected. In reality, Gronkowski’s rehab was in line with the usual 8-10 week expectation. Not only was the PUP list not a consideration, Gronkowski was practicing fully as camp opened. Fantasy Assessment: Rank Jimmy Graham as the TE1 based on his statistical upside and worries about the distribution of touches in the Patriots’ offense if you like, but last season’s ankle injury shouldn’t factor into your projection of Gronkowski whatsoever. Darren McFadden, Demarco Murray and Ahmad Bradshaw are also ready to participate fully. Each will be trying to shake off the injury prone label this summer. Murray’s injury should have no long term impact on his play. All signs suggest that McFadden’s Lisfranc injury is behind him, but history suggests he’s a conditioning / muscle strain risk early in camp. Bradshaw had a comparatively less severe injury last season, but his chronic metatarsal injury is more likely to cause problems this season than those sustained by McFadden and Murray last year. We’ll see how each progress in the early weeks of camp. 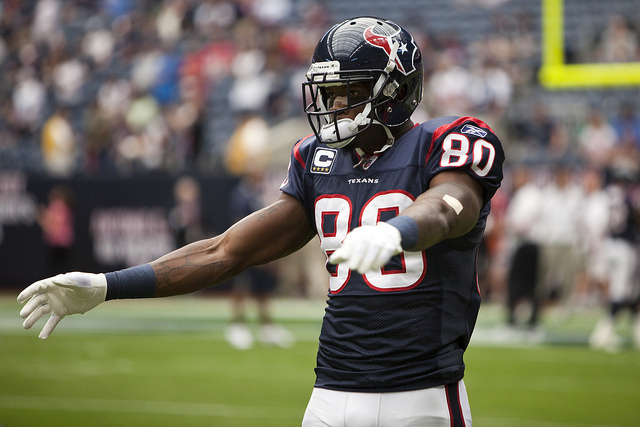 Is it time to look at life after Andre Johnson, in dynasty leagues? Maybe time to grab his replacement? And who would it be? Posey maybe? Looks like Johnson’s situation is of the hyper-cautious variety for now. I still like Johnson as an elite tier WR and I don’t see a ready replacement on the Texans’ roster. I like Jean and Martin better than Posey of the current candidates.